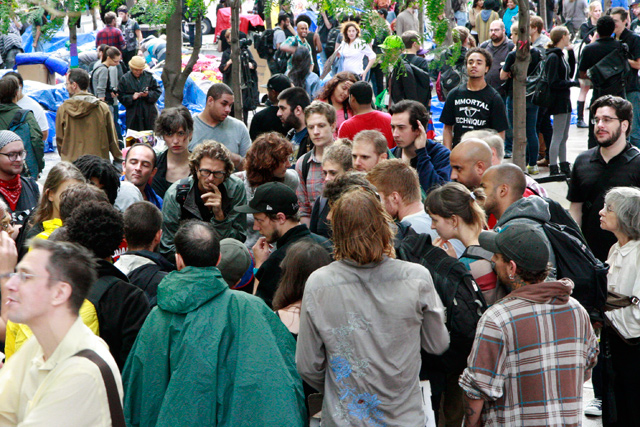 A video by Iva Radivojevic and Martyna Starosta exploring how Liberty Plaza is being inhabited by the Occupy Wall Street movement. "This space is our sonogram of potential." On May 6, 2010, trillions of dollars — about 9 percent of the total world market — sloshed in and out of existence like a clumsy child carrying an over-flowing milk pail. The celebrated capital liquidity that is the hallmark of the wide spreads and cheap trades associated with High Frequency Trading (HFT) turned into hot lava as a result of the automated programming of a few trading algorithms. Traders the world over watched open-mouthed as the second-largest point swing (1,010 points) and the biggest one-day point decline (998.5 points) in the 114-year history of the Dow Jones Industrial Average unfolded over the course of 30 minutes. Especially jarring for those who pay attention to the world's financial ecology was how the Flash Crash seemed to defy traditional conventions of space and time. Even the traders on the floor were confounded: Their bodies, the frantic voice of the announcer and the space of the stock exchange itself seemed pitifully quaint in comparison to the typhoon of 0's and 1's rocketing back and forth. The “flash” was no more than a horrific blip only because the Chicago Mercantile Exchange was eventually able to pull the plug on the algorithms that were playing hot potato. But it became apparent that capital is hanging by a thread, as lightning-fast trades circle the globe continuously, beyond the average person’s understanding. Traditionally, trades were executed by humans in close physical contact with each other. Hand gestures, emotional vibes and verbal outbursts ricocheted in the chambers of the Chicago, New York and Tokyo stock exchanges. Capital was moving, but within the context of humans communicating with other humans — even a day trader was in close contact with his or her clients over a phone line. The rapidity of HFT leaves human perspective in the dust, as market trends fall increasingly into an endless loop of responding to their own responses before the human world has a chance to catch up. But there is another event unfolding that also pushes the boundaries of speed and unpredictability. While millions of trades are executed every second with little human oversight, the world is collectively witnessing — if not participating in — a rapidly evolving gesture that solidifies the power of a particular body in a particular place. Today's globalized market place and the decentralized claiming of public space through protest are both powerful examples of how unpredictable flow — the gyrations of capital, the rhizomatic distribution of bodies – dictate and restructure ecologies. The collective gathering of human bodies is a different sort of liquid force, one that has the power to dissolve the traditional boundaries of territory and of how community is usually imagined under the umbrella of capitalism. One could see the emphasis on direct action through spatial occupation as a direct response to the mercurial unpredictability of today's robotized financial systems. “There is nothing to oversee the hyper growth of derivatives or high frequency trading or endless debt games, because there is no global institution that equates with the global markets. It is a clash of the market state and the nation state … The market state is winning, which is probably why we are all on the brink of losing everything." The Occupy Wall Street (OWS) movement that manifested on Sept. 17, around the corner from the New York Stock Exchange, recognizes the failures of our current systems of government and market-capital. There is a critical misunderstanding on the part of the mainstream media that the people who gather in New York, Boston, Los Angeles, Chicago, Stockholm and hundreds of other cities are a disparate mob of disaffected and powerless individuals. Instead, what I saw (and participated in) at Liberty Plaza was a quick adaption to change through the decentralized organization of a constellation of groups created on a need-by-need basis. Being able to change quickly, a trait lauded in the financial world, is generating new forms of conversation and possibility within the human network of the OWS movement. Basic needs are attended to by dedicated committees that distribute good food and sleeping bags. The very ground of the plaza is mapped by new territorial alignments, dictated by the overlapping and connected needs of people in close contact and constant communication with each other. Painting the protesters as directionless individuals becomes a manufactured problem of spatial isolation. We are taught to be bodies that need to be clothed, fed and entertained so that we can function as productive workers, rather than bodies who can move together into a larger network of physical possibilities. The power of this movement lies in the fact that the gatherings of people represent themselves not as consumers, or even as voters, but as bodies in communication with other bodies, actively participating in the creation of a new horizontal community. 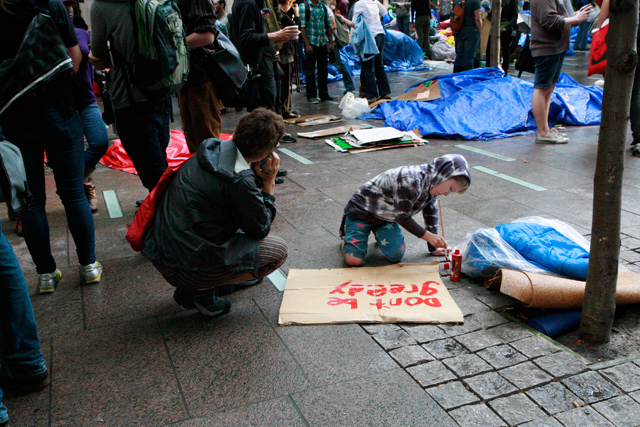 The protesters who literally got down on their knees to scrub the plaza clean (which had been maintained from the beginning of the occupation by a dedicated OWS Sanitation Crew) became a powerful example of swiftly enacting ownership by taking responsibility. Brookfield Properties will now have to come up with a stronger pretense for enacting private rules in a public space. This movement is exciting because it is in a constant flux. This flux is always mediated by the fact that groups of humans are working with the physical limitations of occupying an urban space built with a consumer in mind. This is a movement of anti-stasis through redrawing boundaries and expectations. This is a movement of bodily articulation over the cold manipulations of code attempting to generate capital for capital's sake. Prudence Katze was born in Memphis, Tennessee, and has been Occupying New York City for the past seven years. Credits: Photos from OWS at Liberty Plaza by Prudence Katze.